Excellent battery, only started using it but so far it looks very good. Ordered this for my motor home when my old one went whilst in Spain, the guys at Tayna were great, the battery arrived really well packed and with full installation instructions. Craig was very professional and confident. I am sure this will last longer than the last battery which was only one year on full output and a further two on almost nothing. Get a brand name, Don’t buy the cheapest!!!! I bought this to replace the failing leisure battery in my motorhome. The old battery was supposedly 110Ah but in practice its storgae capacity was a fraction of that, lasting only a couple of days. This new battery is more conservatively rated and certainly lives up to its specification. Altogether well worth spending the extra money on a premium product. This was a like-for-like Varta battery replacement. The last battery lasted approximately five-years and I hope that this one will provide a similar lifespan. It was the ease of purchase, price and delivery tracking which prompts me to award five stars for both the battery and the supplier (Tayna). What an excellent company. The battery's are good quality and the delivery to Portugal at Christmas time was much appreciated. Fast and friendly service battery is great and working well. Replaced original liesure battery, everything perfect so far. Excellent quality and service. Packaging, wait time and communication was great. Shipping cost was too expensive however. Overall very happy, thank you. These batteries are not yet installed in my motorhome yet but they were highly recommended. Tanya Batteries were the most competitive price on the net, their ordering procedure was very quick and efficient and was followed up very professionally. Excellent product and excellent service. What more can one ask for. Too soon to tell if the batteries are ok, but the service, delivery and price from Tayna were all very good. 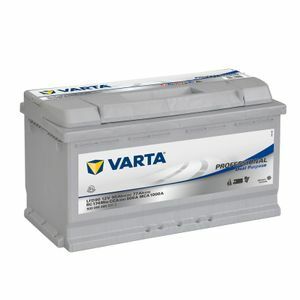 I bought this Varta LFD90 to replace two old 110Ah leisure batteries in my motorhome. I did some research and I’m convinced that the silver powerframe technology is the best and longest lasting and these batteries can be used for both engine or habitation applications. The battery arrived within the 1 hour delivery time given and it’s run everything I need so far with hardly a change in voltage, whereas the two old batteries were all over the place. So I’m very pleased with the service and the product thanks.